Karl Lagerfeld is synonymous to fashion, bold, outspoken, innovative, hardworking, timeless and much more! Leading three international fashion brands, Chanel, Fendi and Karl Lagerfeld, this 83 year old German fashion designer believes that he is the most normal thing in the world. After taking a look inside his 18th century styled Parisian home and his private library, let’s step inside his office in Paris. 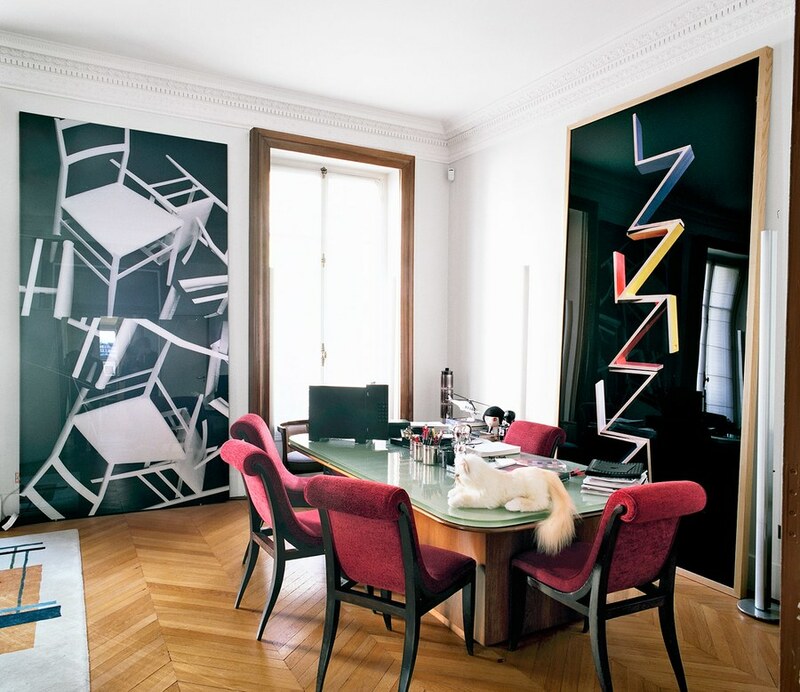 The doors of Karl’s Paris office open to reveal a space which he shares with his sole-n-soul companion as well as his muse, Choupette. The designer shares that he loves his desk which belonged to the famous French architect Michel Roux-Spitz. The comfortable red chairs from the 30s give his office an Art Deco spirit to match the decorative woodwork and fireplace. Another interesting object of desire is the self-designed “KarlBox” for Faber-Castell, which he loves. Loaded with colored pencils, pastels, and pens, which he considers as the best tool to work with, it’s a very luxurious, limited-edition object. Renowned for his signature working style, since many years Monsieur Lagerfeld makes use of his favorite Shu Uemura eye shadows and little brushes to color his sketches. The office floor is also lined with a colorful carpet, inspired by Constructivist paintings, but of course, designed by none other than the Czar of fashion world. Other noteworthy features from his work space include a helicopter which is a scale model of the one he interior-designed and a Choupette teddy bear made for Steiff. Also don’t miss out on the famous Diet Coke bottle with his silhouette and a big doll called Mon Shu that Karl created for his first collaboration with Shu Uemura. The octogenarian also finds the cup clingers, belonging to him and Choupette, very fashionable. Made by his Japanese friends Sogo & Seibu for the collection he created, they are meant to be put on a glass to mark it and to avoid people drinking from it.